How much science communication should / do people do? I’ve recently finished the final throes of a major grant application to keep me employed beyond the end of my one year in Dublin (good luck me). As part of this I had to complete a fairly significant section on what effect this research will have (if funded) on UK culture and how I would go about communicating this effectively to the public. This is a pretty standard form and would be completed in some way by most people applying for science funding in the UK (as far as I can tell). This has apparently only been on the books for the last couple of years, but one would expect that UK researchers would therefore be burying the world in their sci comms stuff in the next few years and the process should have started if every one of them has to do more outreach as part of their grants. And yet….. Look, I know it is tough to find time to do science communication. Not everyone likes it or is good at it. The media can be indifferent to your work no matter how exciting you (or other researchers) might think it is. There are lots of ways of getting the message out there beyond a blog, newspaper articles etc. and one 5 minute spot on national TV reaching a million is arguably better than a thousand blog posts read by the same 1000 people. There are also lots of little things that can go unnoticed like consulting to a TV show or article, doing talks in local schools, designing a museum exhibit, and so on, which are easy to miss but are every bit as valuable. However, I can’t help but suspect that this is simply not the case and that people are not doing have as much as they could or indeed should. If the UK science councils are really serious about this kind of thing then where is all this extra stuff? As I say, I might be missing loads by mistake, but (and I’m trying *really* hard not to be self-aggrandising here) I seem to produce more science-comms stuff than some entire departments. If everyone is effectively contractually obliged to go out and do much more science communication work than before, then were is it all? OK, it will take a while to kick in as more people get these grants and fulfill their commitments, but surely this should have started by now. I’m not suggesting everyone *should* do lots of this kind of work. Not everyone does have time, not everyone enjoys it as much as I do. For that matter, I don’t actually think that it should be a requirement of the job (or a grant). But, and this is the key point, if you are going to at least partly base the criterion for receiving funding on the quality and amount of science communication then it would be nice to see that this is really the case and that this in enforced in some way. If those are the rules that are being set and the demands that are being made, then I’m unconvinced that I have seen the outcome you might expect from it yet. From the outside (and I freely admit I could be profoundly mistaken) it does not look like people are doing what is being asked, indeed demanded, of them. The next few years are going to be very interesting, and hopefully, very productive time for science communication in the UK. I’d also be intrigued to know what experience my colleagues in the UK and abroad have had of these systems. Are the enforced? Do they even check what you did? Are they even considered important in the review process? Any comments will be most welcome. This went down quite well last time, so here’s another go. I don’t have the time or originality to come up with a whole new list of categories and obviously this is horribly biased by my own work / experiences / opinions. Tough. Well another year is all but over and the Musings, in all it’s incarnations, is now well into it’s fourth year. Eek! Still, the end of the year does provide a good opportunity to look back since the whirlwind of academia and the huge lag times of some projects means it can be very easy to lose track of what actually happened when. Last year, I stuck to a month by month review but this time it seemed easier to stick to major highlights. While I have been putting up guest posts in various forms since the beginning, they really broke out in 2010. 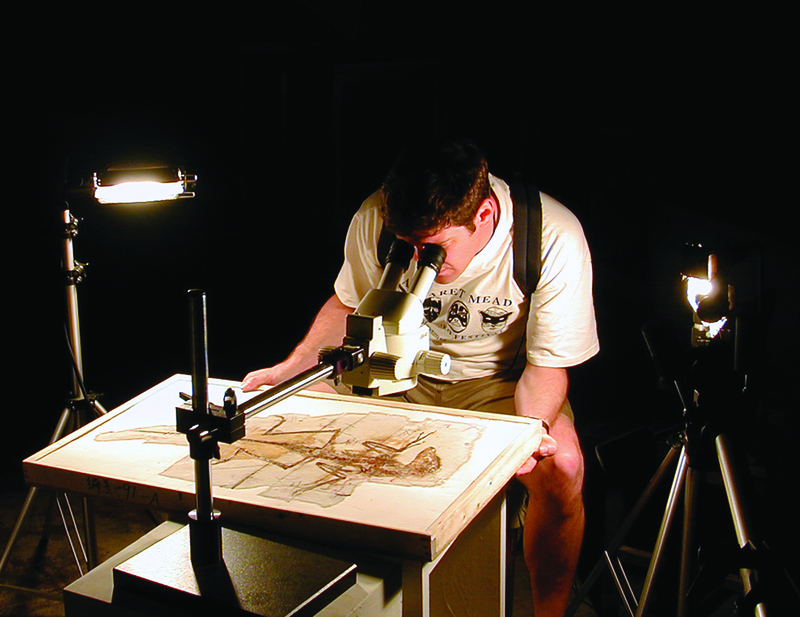 I had more than ever before and managed to get a number of researchers to describe their work, and especially new taxa, as the papers came through. The ongoing series of palaeoart interviews with many great artists has been a shining success with more hits and comments than pretty much anything else I have done on here, and has been a highlight for me too as I get to find out more about the background and thinking behind the work of many of my friends and colleagues. Finally, Darren Tanke’s superb commitment to his guest series (14 posts and counting!) as part of his Gorgosaurus preparatiuon has finally meant that this site has covered prep work properly (even if i didn’t write a word) and with great depth. Sticking to the science communication side of things, Jan 2010 saw the official launch of Pterosaur.net and the accompanying blog (even if it was up and running in late 2009). This last year also saw the rebuilding of my Ask A Biologist site which is easier to use, more popular, and better looking than ever before. Another big dinosaur podcast also went down well, with thousands of listeners reaching a whole new audience. Thanks to all who have helped here. On the subject of P.net, 2010 was always going to be a big pterosaur year what with the 2010 Flugsaurier meeting in Beijing. Another success after the launch in Munich in 2007, this gathered together dozens of pterosaur researchers to bicker and argue in totally new surroundings and resurrect old grudges and disagreements. A great time was had by all. Flugsaurier was just one part of a stupidly busy summer for me. An interview back in Dublin meant that I traveled to Europe and back in just a few days, then moved apartment the day after my jetlagged return and went into the field the day after than. A couple of weeks of chasing down dinosaurs in Xinjiang and I was back in Beijing for Flugsaurier before I took up my new post in Ireland. So finally my time in China is up, at least, in terms of being there full time. Three years was a long time to be ‘away’, especially as it followed two in Munich, but I’m now back in the English speaking part of Europe and much closer to friends and family. 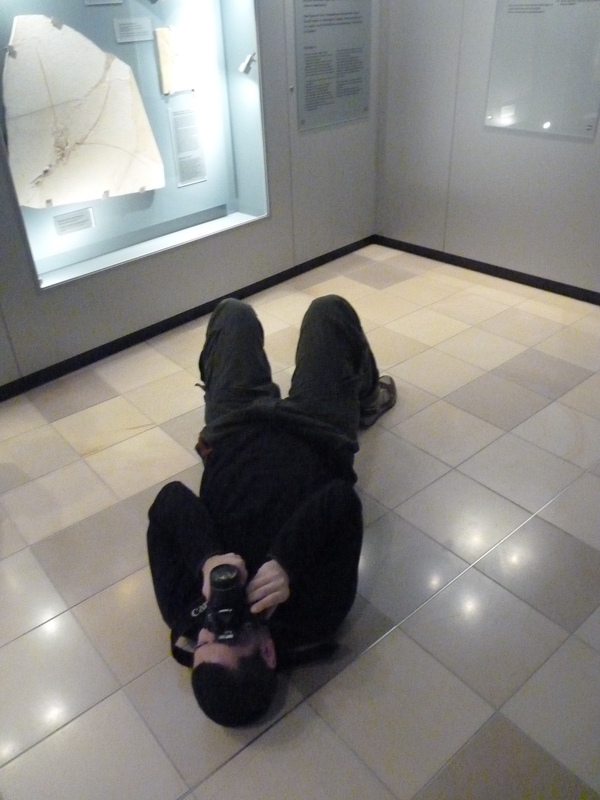 I’m carrying on my work in China of course though, with at least 2 trips already planned for the first half of 2011, I’ll not be short of jian bings or fossils. On the research front, as ever I have been dabbling with pterosaurs an dinosaurs and various aspects of the two in terms of evolution, anatomy, taxonomy and more. Still, for me the highlight or main feature of the year has been the publication of a number of papers highlighting the behaviour of various theropods in terms of their behaviour. it was great to see bits on spinosaurs, alvarezsaurs, dromaeosaurs and especially tyrannosaurs get published. With a bit of luck, 2011 will see more of the same too with more papers in the works, and those who were at SVP this year (unlike me) might have spotted from the abstracts or presentations I was involved in. That’s it for now. 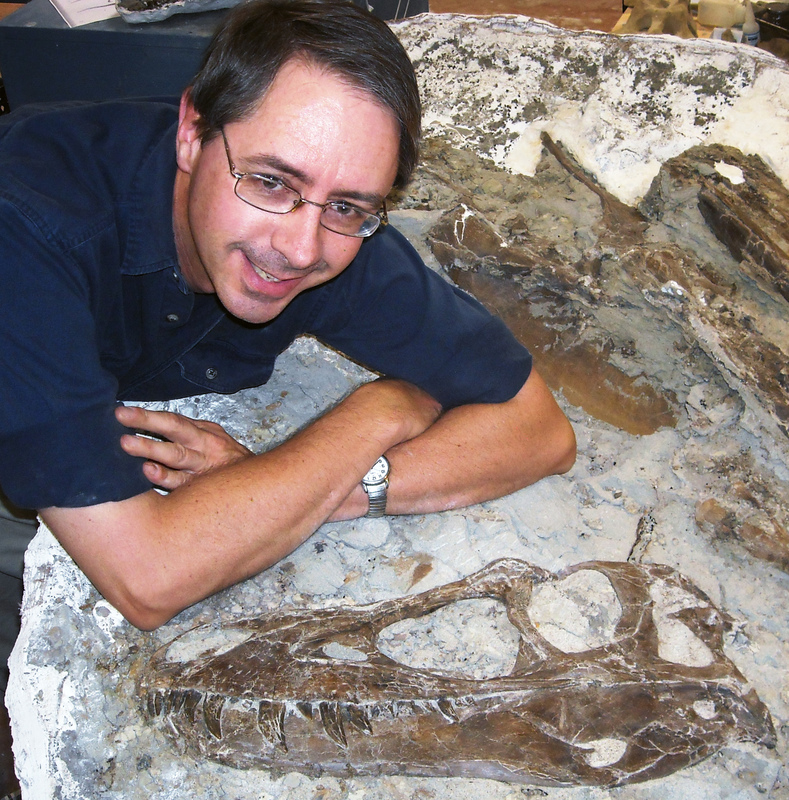 A successful 2011 in research and palaeo for you all. 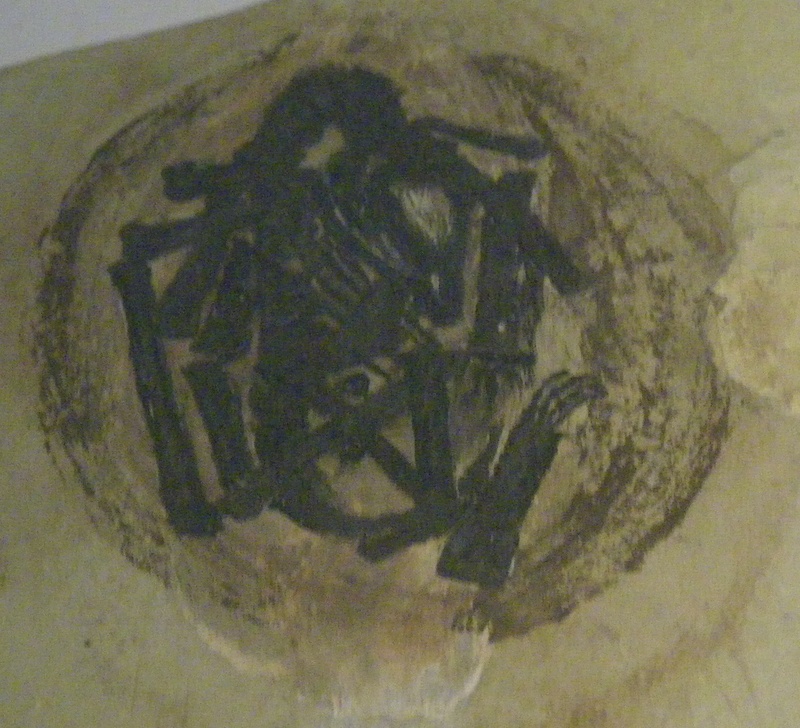 This is a less than perfect photo, but then it is of a poorly painted cast, at an angle, under a spotlight, behind glass and of something rather small and delicate. Even so, it does at least, I hope, show that this is a very small animal surrounded by some kind of round wall and with long of long thing bones lining up inside. Yes this is one of the only three pterosaur embryos known worldwide. Sadly as often happens with such things we got some Nature papers and then, well not much since. Nearly a decade on there’s no detailed commentary on any of these specimens and that is a real shame. OK, so they are far from the greatest vertebrate embryos going being rather flat and crushed and perhaps the less said about the skulls the better, but still there must be more information in there and it’s been quite a few years now. Here’s hoping anyway. There are far too few good pterosaur mounts in museums around the world, but admittedly with generally good reason. They are hard to model, there are few casts around, the interesting ones like Pteranodon are really quite big, and really you want them flying. That means mounting stuff on the ceiling which is difficult and even dangerous (well, public safety at least becomes an issue). And of course, much as I might loathe to admit it, they are just not as popular as dinosaurs. Still, there has been a slow but steady increase in the number of mounts like these turning up which is a good thing. 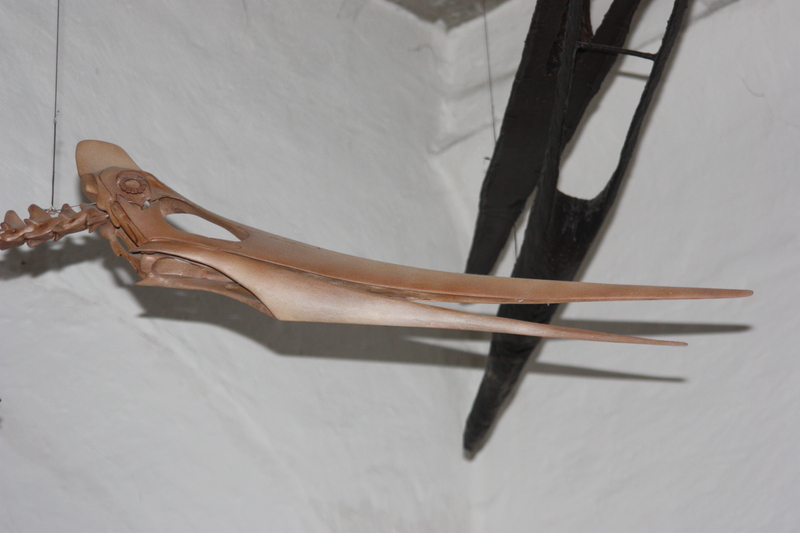 This particular one is in Eichstaett, and lovely it is too (thought the black Quetzalcoatlus above it is not half as nice). The mount is actually not far off the ground which make it easy to get a good look at it (I have seen an Anhanguera mounted about 5m off the ground in Frankfurt and you can barely see what is obviously a nice model) but the downside to this is that it’s very hard to get far enough away to get the whole thing in frame, as the last photo shows. This is the Gorgosaurus preparation update for December 15-17, and 20-23. Progress continues unabated, but is visually hard to see as so little rock gets removed now. Some days less than a sugar cubes worth is removed. 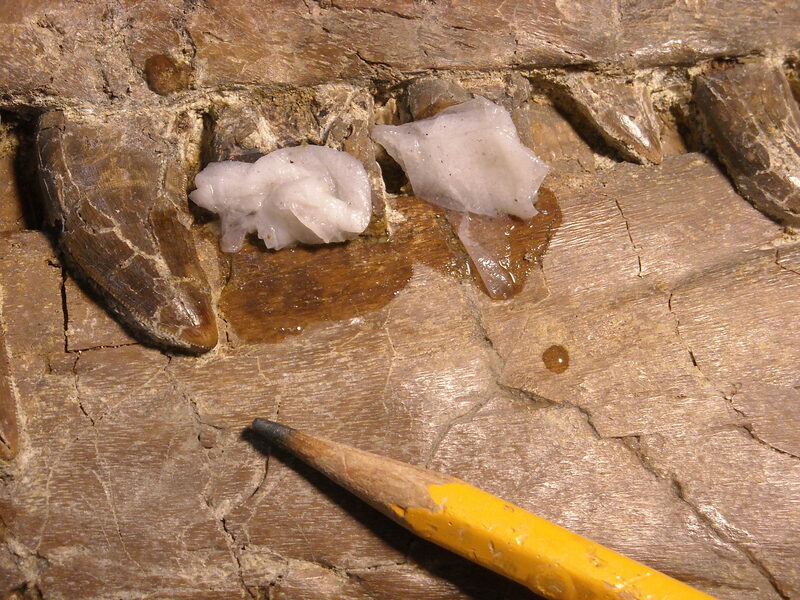 Much of the work now is stabilizing rock with glue and doing fine cleaning of the bone surfaces. The last of the back of the head is now uncovered and it looks like the skull will be 520 mm long give or take a couple millimetres. 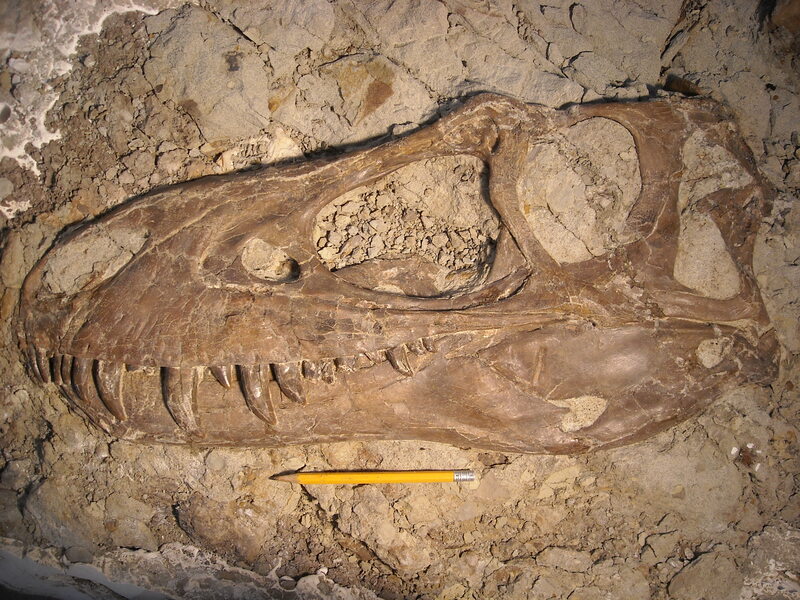 The skull preparation is essentially done now- only a few minor cleaning and fixups required. Much gluing of tiny cracks is being done. 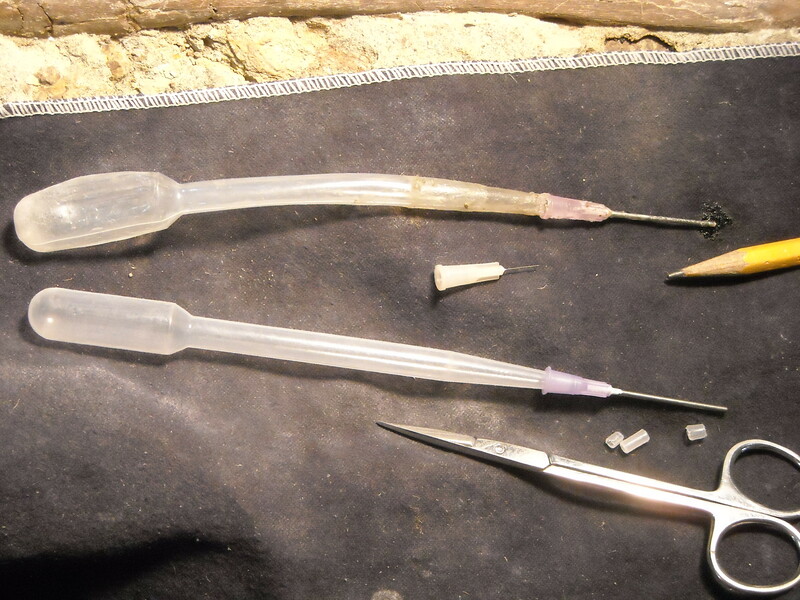 Most preparators use big eyedroppers or medical-grade syringes to inject glue, but I find both too coarse to get the job done, so I developed my own handheld modified eyedropper system years ago. My old modified eyedropper was falling apart so I recently made another. I take a plastic eyedropper and snip the tip off so it can firmly carry a medical grade syringe needle tip. The tip of the needle is carefully ground off. This is done so one does not accidently inject themselves with glue or get stabbed. We have a wide variety of needle sizes (gauges), from tiny (diameter of fine hair) to large (pencil lead diameter). The needle is pressed against a crack or hole and the bulb of the eyedropper gently but firmly squeezed. One can see the glue actually move along the crack and adjoining cracks as it wicks along. This is very time consuming, but necessary work. This is usually done on surface bone, whereas the glue bottle dispenser concept shown in a previous update is more for internal bone and matrix stabilization. Areas of harder rock are softened with tisse paper lumps soaked in water. These are placed upon problem areas and allowed to sit for 10 minutes or so. When removed, the rock has usually softened up enough so that it can be carefully scraped off. This will be the last update this year, they will resume early next year. Happy Holidays Everyone! And indeed happy holidays and all that jazz from me too. See you again in a few days, I have exam papers to mark. 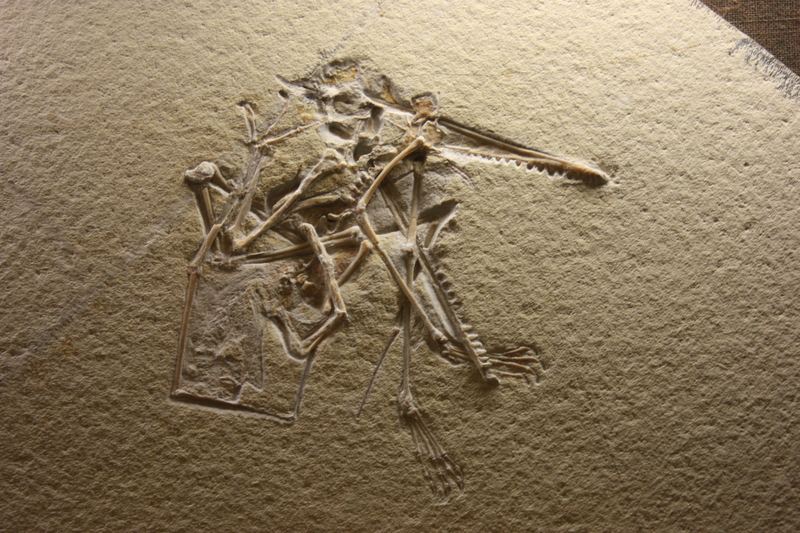 To emphasise the point of my other post on this exceptional Pterodactylus, here is another specimen from the Solnhofen Museum. This one may not look as nice as the other, but the bones are preserved closer to an original 3D state. More importantly, although you can’t see it here, numerous soft tissue parts are preserved. 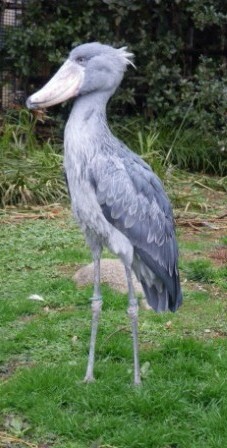 An anterior crest, and occipital ‘cone’, a partial beak and claws and skin around the feet. So while this little critter may not have the obvious aesthetic appeal of the last one, this is probably the more important and significant specimen scientifically. and should be read by anyone who cares about science at all in any way at any level. It’s a genuine shame that this is not plastered over the media in 20 ft high letters but instead I spotted it from a link on Facebook. This is who you get kids engaged in science and understanding science and must be the easiest and most entertaining paper to read in many a long decade. It’s freely available here, so settle down, read, enjoy and appreciate the genius behind this. Very well done to all concerned. 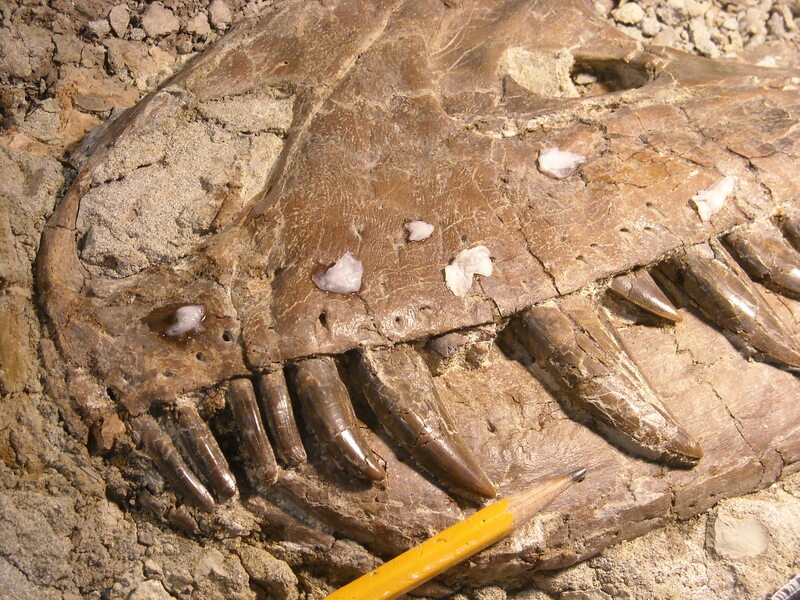 The vagaries of preservation in fossils means that different specimens provide different things. Some have exceptional bones, some have bits or even lots of soft tissue, some preserve unusual features or things seen in odd angles, or just have parts that are often missing like gastralia. Taken in combination of course there is often a lot of information available and far more can be said about a set of fossils than from a single specimen. Ultimately some however just look really nice. This I think is a near perfect example. 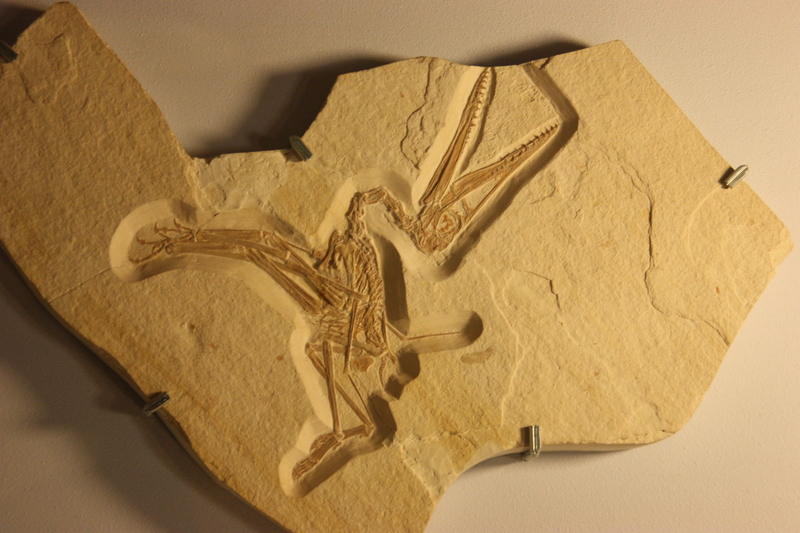 It’s actually a privately owned specimen of Pterodactylus, but it is on public display in the Solnhofen Museum. There are better specimens for some details of the skeleton, certainly there are those which show off more unusual angles, and many have soft tissue where this has none. But it is a striking example of a fossil pterosaur with every bone well preserved and in about as ‘natural’ and undisturbed position as you can hope to see. As long as this remains privately owned and not formally owned by a museum, no one is ever going to describe this (or they shouldn’t really). But that’s perhaps not much of an issue. 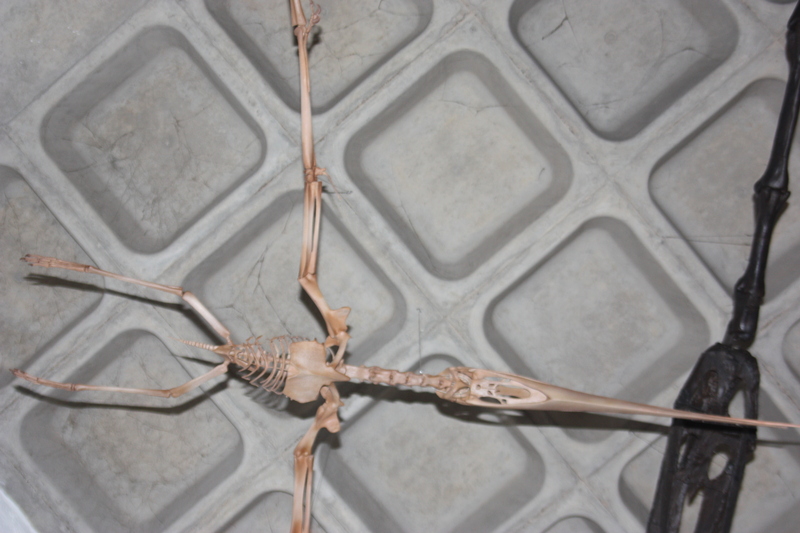 Obviously as a researcher, I want every specimen in a museum, but at least in this case Pterodactylus is so studied and well known from lots of excellent specimens that, excellent example though this is, little to no scientific knowledge is actually being lost or skipped in this one specimen. Still, if the owner would like to give it to the museum, or me for that matter, I’d not be complaining. As this is a private specimen and not in the literature I rather assume that few readers have seen it and so it seemed too good not to show it off here. While I got back from my little trip to Japan almost 2 years ago now, I have still yet to write up my trip to the excellent Ueno zoo in Tokyo (though some phots have turned up here before). 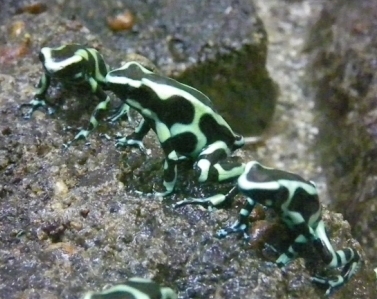 As with much of this series of zoo reports, it’s best to focus on the different or unusual and avoid the basics that any good zoo should have. 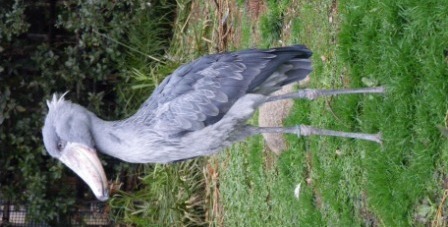 In this case this is rather easy, the zoo was large, well designed and with excellent enclosures. 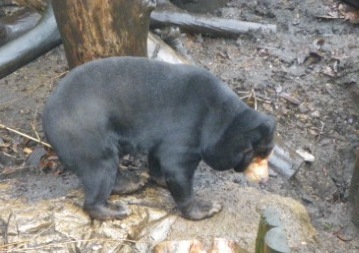 There were some obvious specialties (a really good collection of bears, several birds of paradise) and some unique animals like a Javan tiger and showbills which I had not seen before which is always a bonus for the dedicated zoo goer (I saw teporingos!!!). 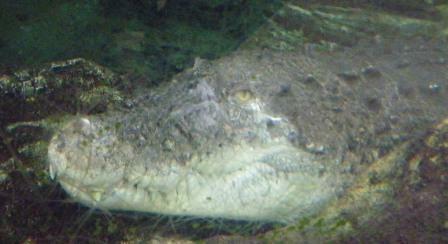 They were in the midst of a rebuilt of the elephant section which looked great and must be open now, and their reptile house while still being given the finishing touches, was brand new and truly first rate with a monstrous estuarine croc in residence. 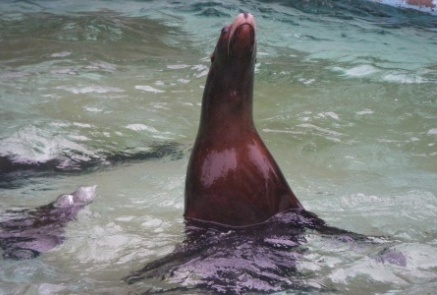 Some set-ups were especially nice, such as the raised perspex box that allowed otters to swim around at eye level effectively outside their enclosure. The last real comment was the size of the place. Split across a road, I had though I’d covered most of it before discovering the second ‘half’ and suddenly it was much bigger. Despite quite a few hours there, I didn’t cover everything and as noted some parts were still under construction or development, so it’s very much a full-day kind of place. 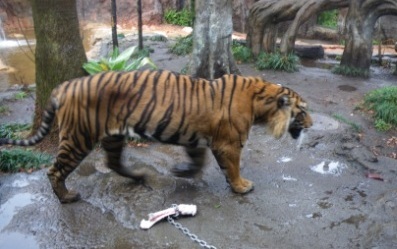 Well worth a visit, though I tend to say that about any good zoo. And certainly you have to admire their commitment to safety.